Are you trying to save a little money when it comes to servicing your car in Indianapolis? Take a look at these great car service and maintenance coupons. Keep your car and wallet happy at the same time! Just print one off and bring it in today! *Restrictions apply. See participating Mercedes-Benz dealers for complete details. Offer only valid on select OEM tires. Tires must be dealer-installed between April 1st, 2019 and May 31st, 2019 to qualify for the offer. Only eligible on Mercedes-Benz vehicles. No cash value. Offer ends May 31st, 2019. Deatil service includes wash, wax, tire shine, interior vacuum, deep carpet and leather cleaning, and windows. *$50 off regular priced detail service of $250.00. 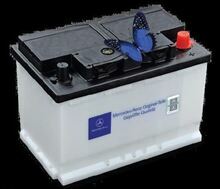 Mercedes-Benz customers have the opportunity to instantly save $25 on eligible batteries.